2011: Collapse Into Now Warner Bros.
2004: Around The Sun Warner Bros.
1996: New Adventures In Hi-Fi Warner Bros.
1992: Automatic For The People Warner Bros.
1991: Out Of Time Warner Bros.
2011: Part Lies, Part Heart, Part Truth, Part Garbage 1982 ? 2011 Warner Bros.
2003: In Time: The Best Of R.E.M. 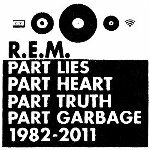 1988-2003 Warner Bros.
2009: Live At The Olympia Warner Bros.
2007: R.E.M. Live Warner Bros.